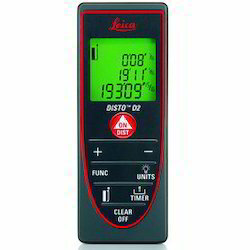 We are a leading and well-known importer, trader and supplier of Leica that includes Leica Builder 500 Series Total Station, Leica Sprinter 50 Digital Auto Level, Leica Distance Meter D2, Leica Distance Meter D5. These are manufactured by experienced professionals, using optimum quality raw material and advanced technology. 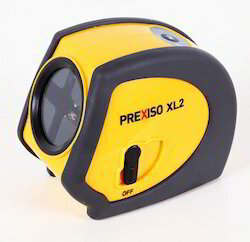 Our offered devices are widely used in construction sites for measurement, thus highly demanded in the market. All these products are made under the hard compliance with international standards of quality. 3 x AA Batteries, User Manual. 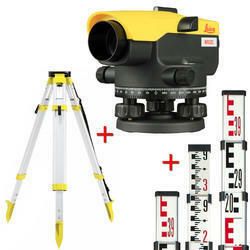 The Leica NA 324 Auto level is a robust, budget-priced construction level. They are quick to set up, simple to use and accurate, with clear, bright optics for easy readings. The Leica Runner 24 can be offered as complete leveling package with the optional sturdy aluminium tripod and telescopic 5m, 5 section leveling staff. 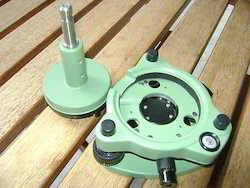 As a quality-oriented organization, we are focused to provide our clients excellent qualityLeica Tribrach Adaptor Set. The offered set is manufactured using high grade components and advanced technology. The offered set is availed in different configuration and other related specifications, in order to meet the variegated expectations of our valuable customer. Our provided range is rigorously tested by the team of our vendors' professionals. Furthermore, our clients can avail this set from us at market leading prices. Having Power Range Technology & Bluetooth, Measuring Range 0.05m-100m, Accuracy 1.0mm, Tilt Sensor ±45º, Area, Volume Calculation, Indirect Height Measurement using Pythagoras Method, Moon Light Display, Measuring Units mtr, ft, inch, Recalls Last 20 Points, 5,000 Measurements per set of batteries, Weight 150g. Along with Soft Carrying Case, Wrist Strap, Target Plate, 2 x AAA Batteries. 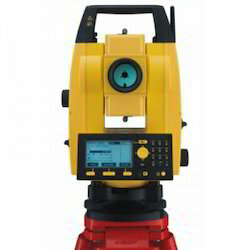 We offer an impeccable range of Leica Builder 500 Series Total Station to our esteemed clients. Our offered range is intricately designed from top quality material and cutting-edge technology at vendors end, in line with set industry standards. These devices are equipped with wireless communication via Bluetooth, which covers the full range of tasks to be performed on any construction site. 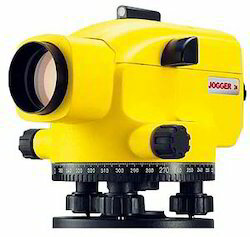 Our company is devotedly involved in offering a broad range of Leica Jogger to our respected clients spread all across the nation. It is an ideal instrument for all your daily leveling tasks such as Building and Civil Engineering, Profiling, Landscaping, and Area Leveling. The offered jogger is extensively appreciated and demanded in market for its salient features such as sturdy construction, perfect finish etc. Further, this jogger is checked on different parameters to ensure that we are delivering only flawless product to our clients. Measuring Range 0.05m-60m, Accuracy 1.5mm, Area, Volume Calculation, Indirect Height Measurement using Pythagoras Method, Backlight, Measuring Units mtr, ft, inch, Recalls Last 10 Points, 5,000 Measurements per set of batteries, Weight 90g. Along with Soft Carrying Case, Wrist Strap, 2 x AAA Batteries. 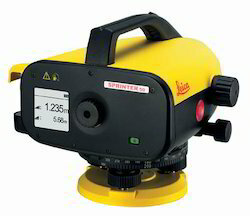 Looking for Leica Make Survey Instruments ?